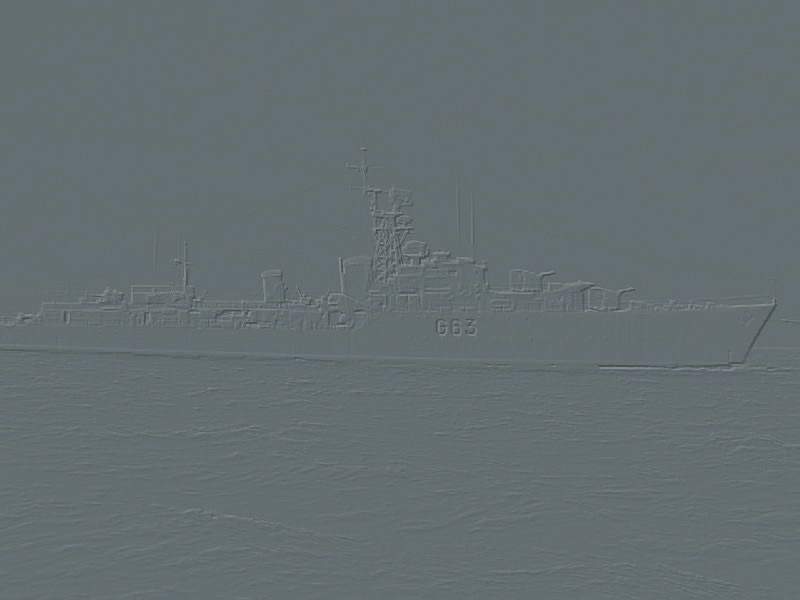 This document contains much sought after information regarding the modelling of Canadian Tribals class destroyers and in particular, HMCS HAIDA. There are no known sources for HAIDA's deck plans at this time. A 1/350 scale model of HAIDA is now available from Resin Shipyards. For an independent review of the model click here. 2) Deans Marine is a popular company in the UK for 1/96th scale models. 4) Links to other model resources and information can be found at Task Force 72 Scale Model Ship Association Inc. in Australia. In general, Canadian Ships of WWII used RN colours. Paint chips are available from Snyder and Short. M id Grey Green: 110 drops of Humbrol #30 to one matte white. The reason for the off white and pale blue at the forward end was to make them almost invisible when approaching head on. The stern was dark so the ships could keep station on one another. This camouflage was pastel in nature to absorb light, rather than reflecting it. It worked. When Haida sank T-27 the Germans never saw them and thought they were being shelled by a cruiser. From time to time, people would like to build a model of the Iroquois and enquire about the paint scheme. Iroquois was originally in a WA Scheme the colours being WA Blue and white, decks B30, masts white. She then went to a Light Admiralty Disruptive scheme the colours being 507A, B5 and 507C, decks G20, tops of masts and crowsnest white. In 1943 all ships wore a variation of the Special Home Fleet Destroyer Scheme. This is the scheme most of us are familiar with. Originally the scheme had two colours, B55 and white, then later went to three colours, G10, G45 and white. Next came a four colour version being G20, B30, G45 and white. The scheme evolved a bit over this time frame as well and not all ships were exactly alike. In the second half of 1944, the Tribals went to a an Admiralty Standard (Light Tone) Scheme. Scheme A which was worn from May to October had the hull panel B20, everything else G45, decks B15, steel decks G10. Scheme B from November to April, hull panel B30, the rest B55, decks same as A. This would be the best choice to be represented in a model. In October 1945, they and all other RCN ships were ordered "to be painted on next occasion as follows: warships - hull G10, superstructure B30". In other words dark hull, light upperworks. In conclusion, look very carefully at your reference pictures and make sure you know just exactly what ship you are looking at. When building warships, normal prop shafts are partially exposed from the hull to the 'A' frame supporting the shaft. To obtain this cut tube to required length, tap out bearing on redundant end and replace it in the new end this still gives bearings at each end. a) Drill hole in tube about one-third way along tube, solder oiler to tube. b) Using a syringe filled with a mixture of grease and 3 in 1 oil, pump grease into tube closing off on end preferable with finger. When the grease reaches the finger stop, place actual shaft into tube again keeping finger over one end to prevent grease being forced out into hull. When you feel the shaft touch your finger the job is done. There are two trains of thought for modeling HAIDA - either as G63 (1943 to 1949) or DDE215 (1952 to 1963). If G63 is chosen, then any photos before 1949 or can be used. There is one minor difference to note and that is the placement of the 291 radar and the DF birdcage antennas. During the September/December 1944 refit, the DF birdcage antenna was moved from the mainmast to the foremast while the 291M radar antenna was moved from the foremast to the mainmast. As DDE215, one can take an unlimited amount of photos showing exterior details. On HAIDA’s superstructure, as DDE215, there are some items which are missing and need consideration when the ship is being modelled. 5) The gash chute is missing. 6) The quarter deck ladder to 3/50 deck is missing. 7) The bathythermograph boom - its about 6" in dia meter and 12 ft long and would have been there most of her 215 service life. 1) The 293 cheesecake antenna on the foremast would have been removed by the late 1960's and should not be modelled for a 1963 DDE215 configuration. This antenna is being displayed as a historical artifact which was originally on the ship. 2) For visitor access, some ladders have been modified while others have been removed. The aft ladder from the bridge does not belong. The ladder, portside aft to the 3/50 deck, does not belong. 3) The light atop the ensign does not belong.